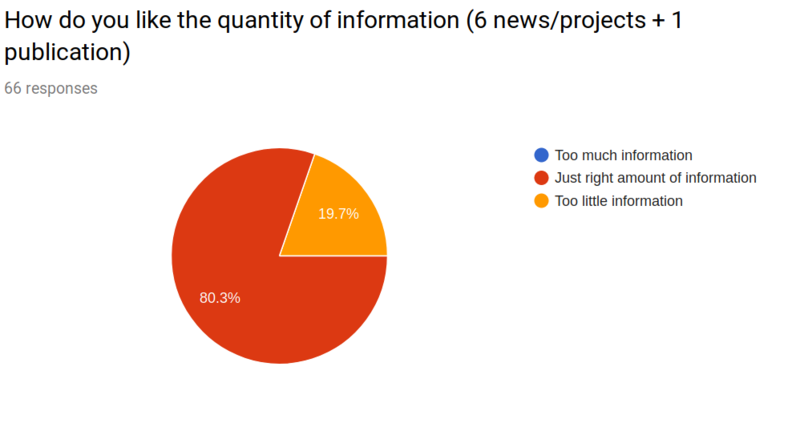 In the issue #32 of Weekly Robotics Newsletter we made a short survey. 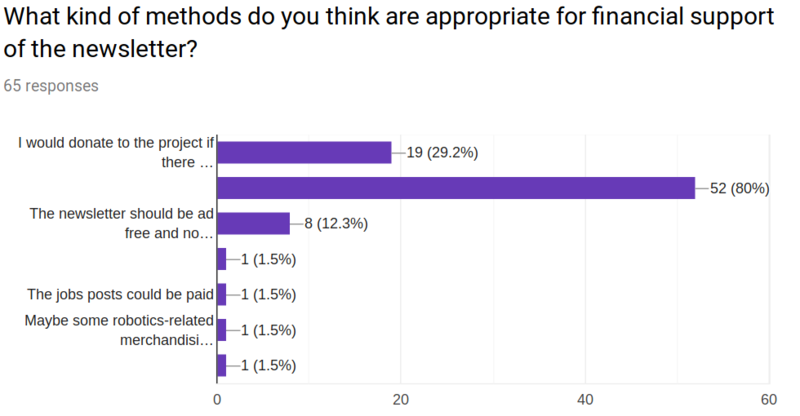 This post shows the survey results and discusses them as well as the current state of the Weekly Robotics and what’s ahead for this project. We had 66 responses to the survey and we would like to thank everyone that invested their time helping us improve. Below you will find survey results with some commentary from us. The results of this part didn’t surprise us that much since robotics subreddit and Hacker News are the channels where Weekly Robotics gets the most attention from. One person indicated that they found us through a search on Google, which makes us hope that we do OK when it comes to SEO (more on that in the Current State of Weekly Robotics). Apologies to the 20% for providing too little links. We would love to provide you more links but having limited time we can’t make a deep enough research to provide you quality resources in large quantities. Yet! Publication of the Week is the most time consuming bit of the newsletter. The fact that 3/4 of you want it to be included makes it a time well spent! We love that all people that took their time to fill the survey learned something thanks to our efforts. We’ve also learned a ton! We are aware that the readers coming from HackerNews and reddit will probably enjoy the simplicity of text only material. For the foreseeable future the format of the newsletter will remain as it is but we might do some cosmetic changes in the future. Most of you like the careers section and some are indifferent (and one reader doesn’t enjoy it). We quite like it as it makes us feel good about ourselves contributing to the industry and spreading the word about interesting companies! Announcement section doesn’t seem to be as popular as career section at the moment but still close to 99% of you either like it or don’t mind it. The fact that 19 readers would donate towards this project makes us sure we are doing things right! Thank you! The majority of people that won’t mind seeing up to 3 robotics related ads in newsletter validates our idea for financing this newsletter. You will see some adverts in the sponsored section as soon as some company decides to sponsor us! 8 readers would like the newsletter to be completely ad free without running any donations etc. We would like that too! But the brutal reality is that this project is a considerable time investment (currently ~220 man hours, or ~ 1.5 man months) and at some point we will need to start paying for distribution, servers etc. The job posts are currently free of charge and we explored the idea of making them paid. We decided to postpone charging for them until the newsletter gains critical mass. It will be good if you add the summary of last week’s issue. We currently have a small description that we add to the page for it to be shown when fetching the link (it’s quite useful for social media!). We will see if we can add it at the bottom of every issue, next to the button leading to the previous issue. I would prefer more research oriented submissions, sometimes they are too much about products which are not very interesting. But good job! Keep it up!! We are doing our best to keep a balance between research and industry (see an opposing view 3 comments down). Added this to our backlog! We think it’s an interesting idea because it helps build the community. The only thing we are worried about is the time required to moderate the comments. Would be cool to see a text only (with minor html for links and text formatting) newsletter. Don’t know why all newsletters have to be branded html when regular emails aren’t. After all it’s the content that matters here. Very valid comment! We like simplicity too. We are considering changing the email distribution service to something hosted by us. When we do it we will simplify the newsletter emails. I would like the newsletter to focus more on industrial robotics applications more than research papers. Also some general info and statistics about the newsletters’ subscribers would be nice. Seeing this comment and the one makes us hope that the newsletter balance is quite OK! Good idea about the info and statistics. We will include the snapshot in a section below and see how we can include such information in the About page of Weekly Robotics website. Currently most of the jobs posting you see on the website are through passive research (that is a fancy way of saying ‘Mat’s looking through stuff on the internet’). We will try to find some time to look for US based jobs but at this time we can’t make any promises! We would need a clarification on the definition on real robotics to properly address this point. According to ISO autonomous drone meets all the criteria to be defined as a robot so sorry but drones are here to stay. We toyed with this idea a bit at the beginning and decided against it because in some issues there is quite often a single entry about a given topic and since there are only 7 entries in an issue we decided that it would clutter the text too much. 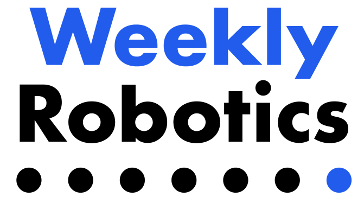 If you have another implementation in mind feel free to let us know @ contact@weeklyrobotics.com and we will see how we can implement it! Nothing, this is the ideal newsletter! Thank you! We are dead set on constant improvement so you will still see some updates! Hope you won’t mind! Hi. I’ve been a follower since Newsletter #1. A feature I found would be useful is if there was a way to 1) Search through your weekly newsletters, and 2) If there were some page on your website that allows me to pick the Weekly Newsletter # that I want. Number 1 is a bit tricky but definitely doable in the long term timescales. We have added it to the backlog. 2) is doable and we will add it to the website in the next couple of weeks. Check out the newsletter “Daily Brew” for a good example of a newsletter that incorporates growth/referrals, and makes it feel like a community. I don’t know who else reads this newsletter, but I imagine it is other roboticists. Would be nice to have a “community” type feel, even if it’s: “Fellow reader and robotocist Bob at Boston Robotics tipped us off to this link….” Keep up the great work! I’ve subscribed to a newsletter “Morning Brew” after this comment (hope it’s the same one author had in mind!) and I really enjoy it! I hope that at some point we will be able to create a community vibe similar to that newsletter. Thanks for the inspiration! Maybe bring a slack or a discord to build up a community. I would like to be able to discuss some of the topics of the ML with likely minded people. The offers are mainly based on USA, and I’m based in Europe. If at some point you receive enough job offers, could you offer the option to select the regions of interest ? Great point on building the community! We would love to start a discord or Slack channel and we will do so once the newsletter gets enough traction. If we reach a critical point (right now almost all job offers are found and vetted by Mat) and the companies start reaching out to add job offers we will split them into regions and limit the number of job posts to 3-5 per region. Currently creating a new issue takes between 4-10 hours (the average is close to 6). This means Mat has spent around 220 hours on this project since August 2018, that’s 1.5 man months (assuming 160h workload per month). We read every article or paper that is included in the issue, sometimes we get super excited about the topic and start researching it further to provide more context and some extra information. 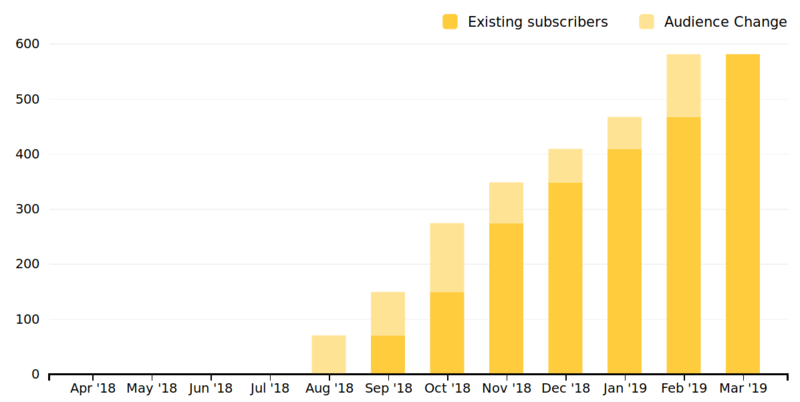 Since Mat first started Weekly Robotics has been growing steadily, only in the past two weeks there was a dip in e-mail subscriptions that we attribute to sharing the newsletter mostly on Reddit and HackerNews and since we’ve been doing so for quite a while now all the interested people are most probably already here. 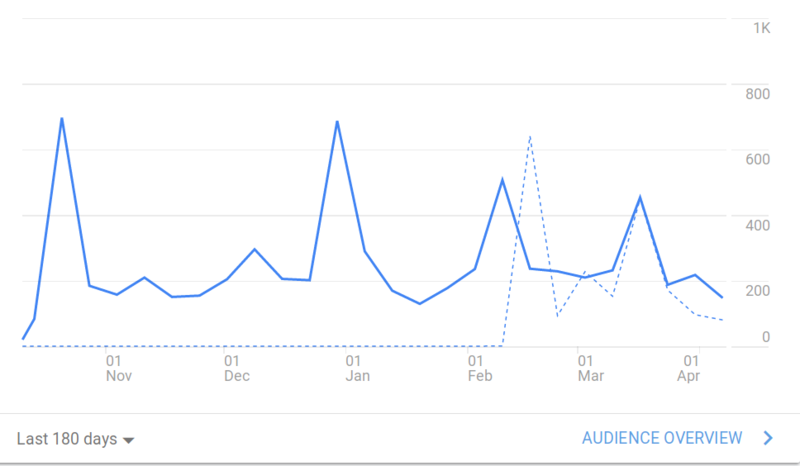 Without further due here are some graphs on how we’ve been doing since starting this project! The most important near term goal is to optimize the workflow for creating every issue and stay below 5 hour mark (at least until the sponsored content starts trickling in). The next goal that is going to happen in parallel is growing the audience. We really liked the idea of growing a community, there were some great suggestions that we received from you and we will start looking into them soon! Other than the above it’s business as usual: Mat will keep his head down, trying to provide you with quality information every week.